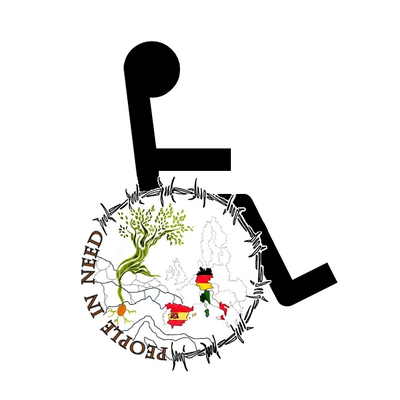 One in every 122 people in the world is currently either a refugee, internally displaced or seaking asylum. The biggest part of the migrants is from Syria. Afghanistan and iraq are the countries with the second and third most people looking for new lives elsewhere. Where are the migrants going? 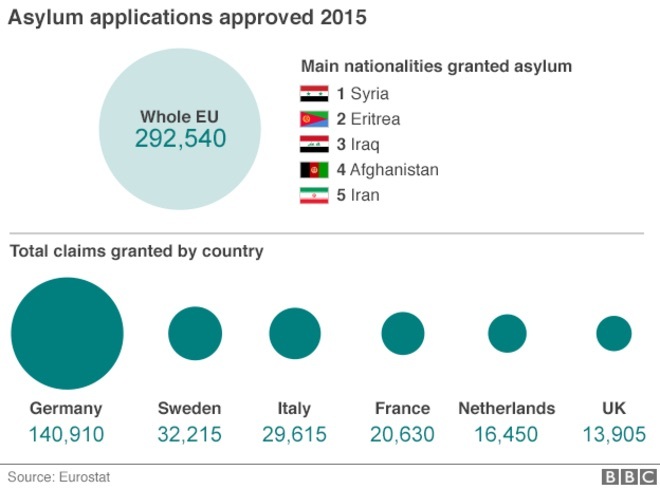 In 2015, Germany had the most asylum applications (more than 476,000), but more than a million arrived. 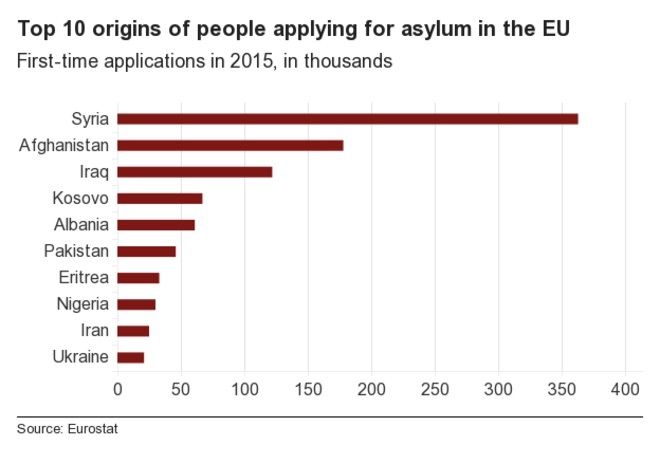 Hungary was in second place with 177,130 applications at the end of that year.Many families who arrived in the EU have stayed in several countries on their long journeys, while others have been driven out of places like Libya where they initially worked or sought refuge before it descended into turmoil. In Greece, 23,000 migrants entered in one week alone. The International Organization for Migration (IOM) said that more than 1,011,700 migrants arrived by sea in 2015 and 34,900 by land.In 2014 there were 280,000 arrivals in total. 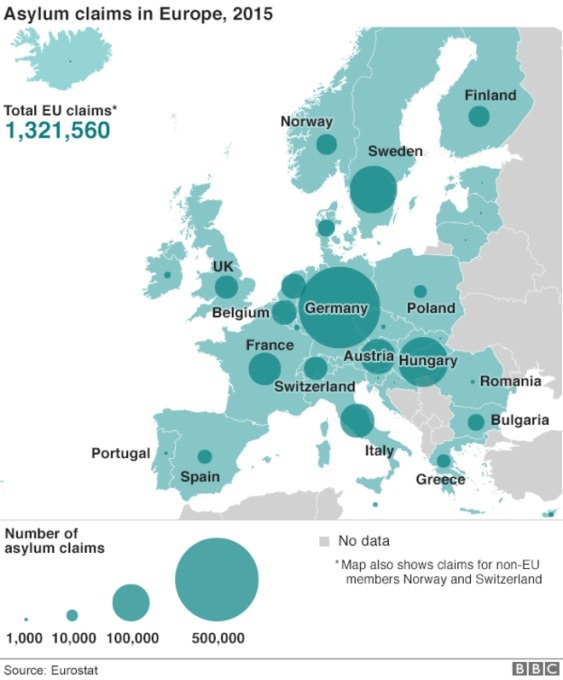 The figures do not include those who got in undetected.The EU's external border force, Frontex, monitors the different routes migrants use and numbers arriving at Europe's borders put the figure crossing into Europe in 2015 at more than 1,800,000.Most of those heading for Greece take the relatively short voyage from Turkey to the islands of Kos, Chios, Lesvos and Samos - often in flimsy rubber dinghies or small wooden boats. What routes are people using? The most direct routes are fraught with danger. In 2015 more than 3,770 people drowned or went missing crossing the Mediterranean to Greece or Italy in flimsy dinghies or unsafe fishing boats.Most of those heading for Greece take the relatively short voyage from Turkey to the islands of Kos, Chios, Lesbos and Samos. There is very little infrastructure on these small Greek islands to cope with the thousands of people arriving, leaving overburdened authorities struggling to provide vital assistance. 2. Write down where the immigrants in Germany come from and how many were there in 2015. 3. Think about which route an African man would take to get to Germany and write it down.